IN 2011, THE FIRST NATIONS SUMMIT, the Union of BC Indian Chiefs (UBCIC), and the BC Assembly of First Nations (BCAFN) collectively formed the BC First Nations Consultation and Accommodation Working Group . The Working Group grew out of a simple and basic reality – the unmet promise enshrined and embedded in the Constitution for honourable reconciliation of pre-existing sovereignty of Aboriginal peoples with assumed Crown sovereignty, and the continuing and serious obstacles to meeting this promise . In particular, one of the central mechanisms that the Supreme Court of Canada has crafted for advancing such reconciliation in the interim before treaties or other agreements are reached is the positive constitutional obligation on the Crown to consult and accommodate First Nations . However, the challenge is that the Crown is largely not implementing this obligation in a manner that achieves the reconciliation purpose of section 35 . Rather than building the relationships, trust, and momentum required for the trans- formational change that reconciliation requires, the Crown’s approaches to consultation and accommodation are fueling growing impatience, frustration, and conflict . It is not surprising, therefore, that there have been an estimated 100+ cases challenging the Crown’s failure to consult and accommodate since the Haida decision in 2004 . In the vast majority of these cases, First Nations have been successful . Yet, real change on the ground is still perceived to be a distant goal as Crown policies and approaches have failed to live up to the principles and spirit of the court decisions, political assertions and, most importantly, the purpose of section 35 of the Constitution Act, 1982 . By Resolutions of the First Nations leadership in BC, the Working Group was charged with mapping out a pathway for transforming the status quo of ineffective, and often dishonourable practices of the Crown with our Nations, to truly meaningful and appropriate government-to- government engagement processes based on respect, honour, recognition of Aboriginal title and rights and treaty rights, and to advance reconciliation in a tangible way for our communities . In considering this task, the Working Group recognized immediately the need to undertake a scan of the legal and political landscape and prepare frameworks, ideas and tools to assist First Nations to advocate for and manifest truly meaningful consultation and accommodation arrangements with the Crown and, where appropriate, proponents . The Working Group has recognized that the Crown seems content to only pursue the “window dressing“ of what the Constitution requires and that First Nations must be proactive and take the lead in creating a meaningful government-to-government engagement process . In doing so, First Nations can bring life to the words of First Nations people and the acknowledgement by the Supreme Court of Canada that First Nations’ perspectives, including their Indigenous laws, inform Aboriginal title and rights and, therefore, First Nation-Crown relations . Economic Policy Full copies of six of the analyses are attached to this Report . The First Nations Policy remains a work-in-progress that will require First Nations input . 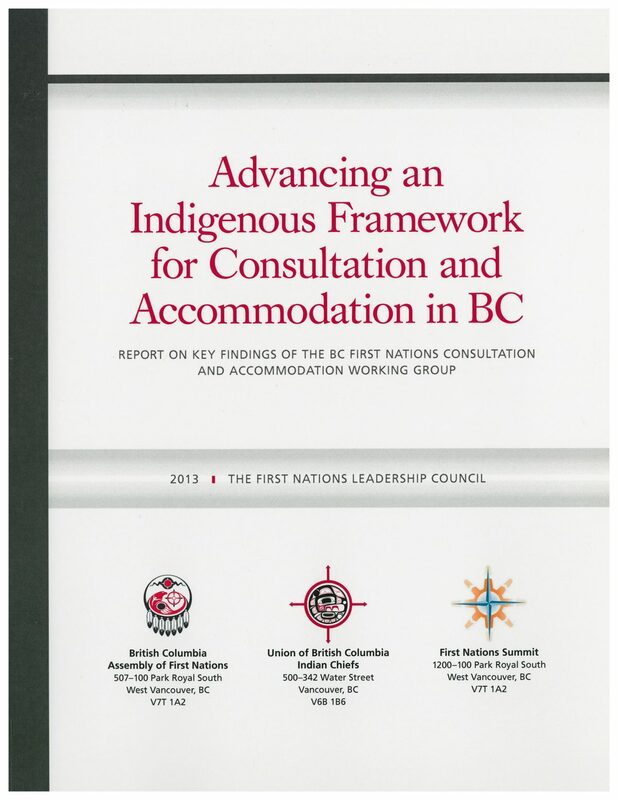 This Report is intended to synthesize the key findings of the six analyses and identifies the core elements that should inform First Nations consultation and accommodation strategies . Based on direction from the First Nations leadership in BC, further steps in this work may involve the development of additional tools to aid First Nations in the essential work of fracturing the Crown’s intransigence to move in the direction the Courts have required with respect to consultation and accommodation, and on a path that will lead to social harmony and justice, rather than greater social conflict and discord .